Over the years, Kotaku has posted so many cakes that the site is now jaded. It takes a lot to impress. It takes a life-sized Stormtrooper. 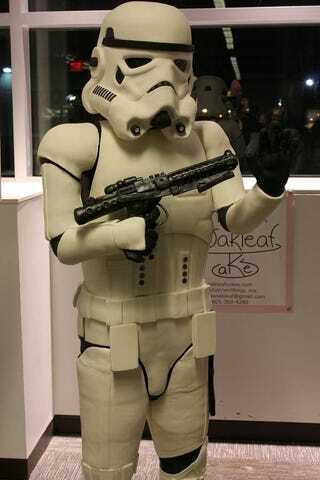 Via BoingBoing comes this 6'4" tall edible Stormtrooper. Oak Leaf Cakes made this large desert for the Arisia Science Fiction Convention in Boston. 6'4"? Isn't that a little tall for a cake?